This year Purim starts with the reading of Megillat Esther tonight, March 4. It is read again tomorrow morning, March 5. We wish a Happy Purim to all of our Jewish Humor Central readers. We hope you enjoy this special Purim spoof from the Purim 2015 issue of The Kustanowitz Kronikle. You can download the PDF by clicking HERE. Print it and share it at your Purim Seudah. And coming tomorrow - Part 2 of our Purim spoof: THE KUSTANOWITZ KIDS' PICKS FOR THE 2014 SILVER GRAGGER MOVIE AWARDS. FAIR LAWN, March 5 – In a stunning overnight development in the run-up to the upcoming elections in Israel this month and in the U.S. in November 2016, the major contenders announced that they will swap roles and run in each other’s country’s elections. Amid the controversy surrounding Israel’s prime minister Benjamin Netanyahu’s speech to the U.S. Congress, nobody suspected that the real purpose of the visit and the speech was to announce that he was withdrawing from the Israeli election and accepting the Republican nomination as the candidate with the best chance of defeating likely Democratic candidate Hillary Clinton. The announcement caught Americans and Israelis by surprise and created a constitutional crisis. Republicans swiftly agreed to cancel all primaries and debates and start campaigning with Netanyahu immediately. The other major Republican contenders rushed to sign up for an Ulpan to quickly master the Hebrew language so they could start campaigning for seats in the Knesset. Serious questions have been raised about Netanyahu’s eligibility to run for the office since he is not a native-born American citizen. These have been muted in the face of challenges to President Barack Obama’s citizenship and his issuance of executive orders that some say override sections of the Constitution. 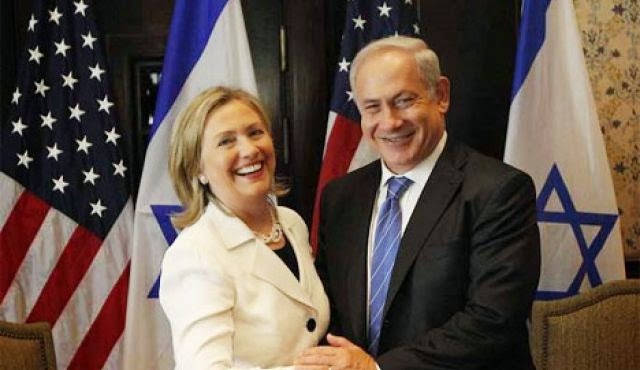 Hillary Clinton’s campaign team was taken aback by the announcement and the sudden entry of Herzog and Livni as new competitors for the Democratic nomination. FAIR LAWN, March 5 – Archaeologists in Israel have just translated a companion to the Shulchan Aruch - the Code of Jewish Law – which contains laws of synagogue behavior which somehow didn’t get included in the editions studied today. Called the Shulchan Hafuch, and written centuries ago, the volume is just as relevant today. The laws deal with proper and improper ways to greet strangers who visit our houses of worship and how to balance the courtesy due visitors with the territorial nature of shul attendance. This possessive attitude toward seats is heightened if our regular Shabbat seat is a particularly desirable one, such as Tevye’s “seat by the eastern wall,” a prized aisle seat, or a sometimes more prized seat at the end of the last row in the back of the shul. For congregants who attend synagogues regularly, seating is a primary concern. After all, it’s a base from which to carry on conversations with close friends, give and get financial advice, review the baseball scores, criticize the Rabbi’s speech, and occasionally utter a prayer or two. The newly discovered laws relate to the situation when you wake up late and get to synagogue well into the service. You go to your seat and find a complete stranger sitting there. What to do? How to claim your seat without insulting the stranger and telling him that he is trespassing and occupying your seat? When our patriarch Abraham saw three strangers approaching from afar, he rushed out to welcome them and offer them refreshment. He didn’t say, “This is MY tent!” or imply that they were trespassing on his property. This mitzvah of Hachnasat Orchim – welcoming guests – is so important that it is one of the ten precepts for which one is rewarded in this world and also in the world to come. This is expressed in the paragraph, Ailu Devarim, at the start of the daily Shacharit service. The Shulchan Hafuch enumerates creative ways for congregants to reclaim their prized seats. You walk into shul and find a stranger sitting in your seat? No problem! Just sit right next to him, very very close. Spread your legs as far as you can and stretch your shoulders until they make contact with his. Odds are that you will shortly have your seat back. As a stranger, he is very likely to be spotted by the Gabbai and offered an aliyah. As soon as he gets up for the aliyah, move back to your seat and remove all traces of his existence, such as a tallit bag, siddur, chumash, placing them further down the row or in another row. This works best if you place your own tallit bag, siddur and chumash on the two seats next to yours. Take the seat next to him. If he appears to want to daven quietly and sincerely, keep starting new conversations, preferably about sports, business, and the world of entertainment. Offer the visitor a handshake. Say “Shabbat Shalom,” “Gut Shabbos,” “Chag Sameach,” or “Gut Yom Tov,” depending on the occasion and the color, style, and texture of his yarmulke or hat. Introduce yourself. Ask if he is the guest of any member. If not, offer to introduce him to other members at the Kiddush, and invite him to your home for a Shabbat or holiday meal. Then take a seat near him, skipping the one immediately next to him. It’s very likely that he will ask if he has taken your seat and offer to move. Mazal Tov! You have just performed the mitzvah of Hachnasat Orchim, made a visitor happy, and regained your seat in the process.